compete against each other in the Cage. 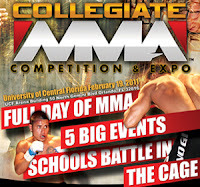 participate in the Collegiate MMA Competition and Expo. WILL BE BROADCAST INTO 47 MILLION + HOMES. COME OUT AND SHOW YOUR SCHOOL SPIRIT! compete; it will also include footage of the fans that support them. 15 minutes of advertising to support the broadcast.